UNH offers many online services that you can access using your myUNH/OneCampus account. Some of these services are Webcat (to check your application status, update your contact information, register for courses, pay bills, and check grades), myCourses (for coursework and assignments), and access to your UNH email account. All UNH applicants and students are assigned a randomly generated nine-digit ID that begins with a "9" to be used for as long as you are at UNH. You will need this ID to activate your myUNH/OneCampus account, request your letters of recommendation and submit your supporting application materials. Note: Your UNH Student ID is NOT the same as your myUNH account or your temporary web application login ID. 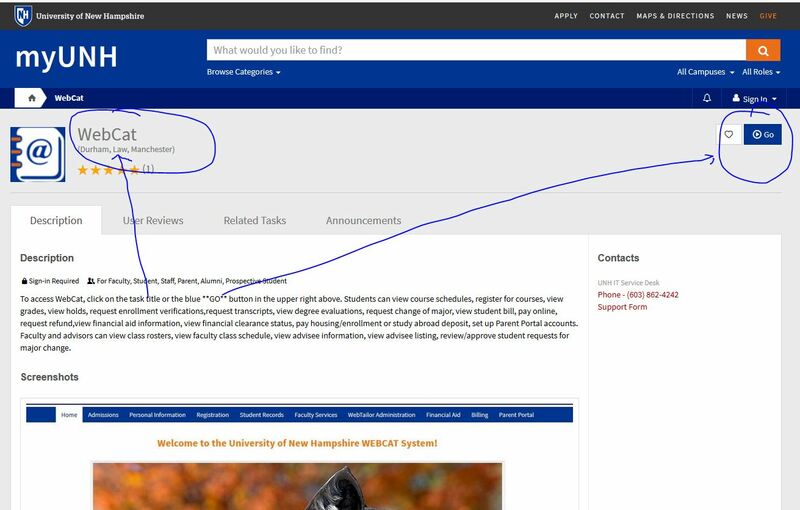 Go to the myUNH/OneCampus Portal click Go, then select the 'Find Your Username' link. Enter your assigned UNH Student ID Number and your birth date. This will give you your myUNH IT ID and will let you reset your password. Login to the Webcat using your assigned myUNH IT ID. Please note then when you click on the Webcat link it will take you the MyUNH Portal. To get to Webcat to login click on the "GO" link in the upper right hand area or click on the "Webcat" header. See this helpful image for clarification. Next select the "Admissions" link from the list and then select the application you want to view under the "Application Status" header. In addition, all applications are verified internally and this process can take up to 2-5 days. Until your application is verified you will have an admit type of "Unprocessed Web Applicant". This status type will be removed once our office has completed the verification of your application. Go the UNH Wildcats Email page and follow the provided instructions. If you have problems please contact the UNH Service Desk. Go to "Accounts" (expand if needed) and click on "Forwarding"